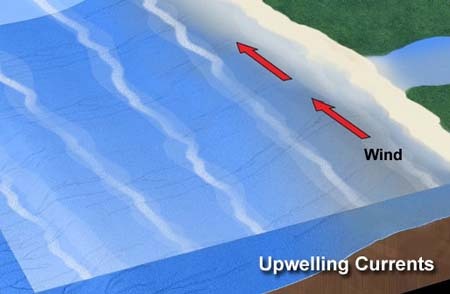 An upwelling is an oceanographic phenomenon that involves wind-driven motion of water accross the ocean surface. The deep water, which is dense, cooler, and usually rich in nutrients, replaces the warmer, usually nutrient-depleted surface water. Upwelling generates very fertile ocean coasts but also creates a cool and stable coastal atmosphere with very low rainfall. Upwelling animation. Winds blowing across the ocean surface push water away from an area and subsurface water rises up to replace the diverging surface water. Source: NOAA. When this upwelling process weakens, as for instance off the Peruvian coast during El Niño events, the system is dramatically disrupted. Phytoplankton concentration and fishing grounds collapse, severely perturbing fishing activities. On the other hand, the coastal deserts finally get some rain. Climate change has an impact on the intensity and geographical position of upwelling areas, which, in turn, has important consequences to fishing industries and those who depend on them. Deep waters are rich in nutrients such as nitrate (NO3) and phosphate (PO4) which result of decomposition of sinking organic matter from surface waters. When brought to the surface by upwelling waters, these nutrients are utilized by phytoplankton, along with dissolved carbon dioxide (CO2) and light energy from the sun, to produce organic compounds through the process of photosynthesis. Because phytoplankton are at the base of the oceanic food chain, high concentration of phytoplankton means lots of food for the entire food chain. This is why the most productive fisheries in the world can be found in these upwelling areas. 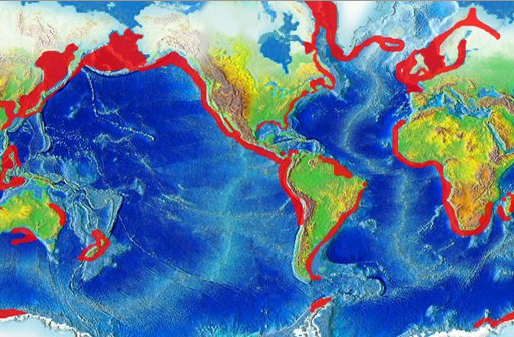 Major upwelling areas along the world's coasts are highlighted in red. Regions of upwelling include coastal Peru, Chile, Arabian Sea, western South Africa, eastern New Zealand, southeastern Brazil and the California coast. Source: NOAA. In the coasts neighbouring oceanic upwellings, typical coastal deserts tend to develop, forming some of the driest ecosystems on Earth. The upwelling of deep cold seawater, driven by ocean coastal currents, induce very dry inland conditions. These coastal deserts can be seen on the western seaboard sections of the African and American continents.